Here’s a cool press release from Truckee: The launch of Nextdoor (www.nextdoor.com) was announced in Truckee. 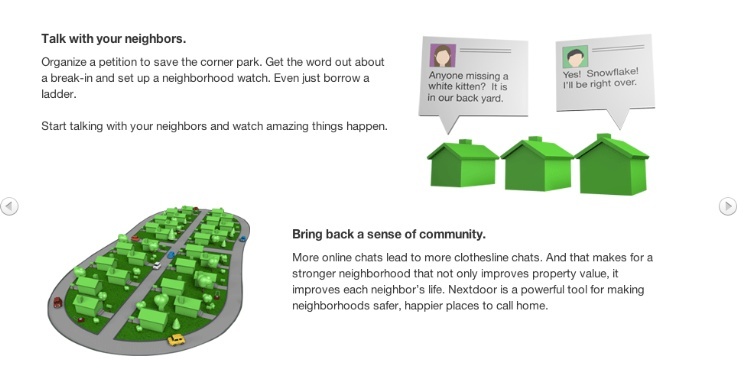 Nextdoor is the first private social network for neighborhoods to foster neighbor-to-neighbor and community-wide communication. Starting now, Truckee residents can use Nextdoor to create private websites for their neighborhoods where they can get to know their neighbors, ask questions, and exchange local advice and recommendations. Topics of discussion on Nextdoor are as varied as local events, school activities, plumber and babysitter recommendations, disaster preparedness, recent crime activity, upcoming garage sales or even lost pets. “We believe healthier and more engaged residents create a stronger community” said Tony Lashbrook, Town Manager, “Nextdoor will help create a stronger and safer community that we call home. Nextdoor was specifically designed to make neighbors feel comfortable sharing information with one another to help build stronger communities and building stronger communities is a priority for our Town. All members must verify that they live within the neighborhood. Information shared on Nextdoor is password- protected and cannot be accessed by those outside the neighborhood or found on Google or other search engines. In addition, Nextdoor never shares personal information with any third parties. Unlike an email listserv or other online group, neighbor posts are organized and archived for future reference. Those interested in joining their neighborhood’s Nextdoor website can visit http://www.nextdoor.com and enter their address. If Nextdoor is available in their area, they can immediately sign up. If a Nextdoor website has not yet been established for their area, active and engaged neighbors are invited to apply to bring Nextdoor to their neighborhood. What a great project. I am proud of my town for encouraging the use of new technologies to connect and engage its citizens. I signed up immediately! I love this idea! For all the understandable concern about our individual cyberlives threatening true 3-dimensional neighborhood life, the Nextdoor approach tries to use the former in order to help build the latter — or at least drag it into the 21st century. Previous Previous post: A speaker for the new community lecture series?